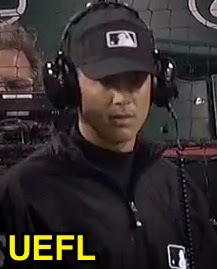 Umpire Chris Segal made his MLB debut during the Mariners-Angels game in Anaheim on April 14. Segal joined chief Tim Welke's crew, serving as Monday night's first base umpire alongside 3B Umpire Todd Tichenor, 2B Umpire Tim Timmons and home plate umpire Welke. He was tested right out of the gate as Instant Replay Review upheld his ninth-inning out call. Segal is on the Pacific Coast League umpire roster for the 2014 season, which is his fourth season in the PCL and AAA. Segal graduated with honors from the Jim Evans Academy of Professional Umpiring in 2006 and began his career with Minor League Baseball in the Appalachian League (worked the Championship Series), with service in the South Atlantic, Florida Instructional and Southern Leagues along the way, having been selected to officiate the 2013 World Baseball Classic Qualifiers, during which he ejected Team Israel catcher Charles Cutler. Segal resides in Burke, VA and wears the sleeve uniform number 96 at the Major League level. The 6-foot-1, 210-pound Segal, who makes his MLB debut at the age of 31, is an alum of St. Mary's College of Maryland ('05), where he was a four-year starter and captain in the baseball program. Segal officiated the Arizona Fall League Rising Stars game in 2012. A stupid rule change that was unnecessary, and definitely needs to be looked at. Got a kick out of Ted Barrett's ejection mechanic, and the way he stepped into it, lol.